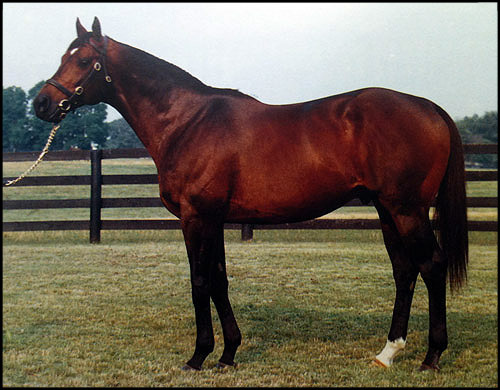 Thinking of new TrueNicks stallion Remind (TrueNicks,blog), it reminded me about his phenomenal sire Deputy Minister. This seemed like a fine opportunity to take a look back at his impressive racing and stud careers. The Ontario-bred son of Vice Regent was a remarkable two-year-old. Winning his first six starts in Canada, where he secured championship and Horse of the Year honors, Deputy Minister would capture the Laurel Futurity (gr. I) and Young America (gr. I) en route to being named U.S. champion two-year-old colt. He was eight for nine that season, with his only loss coming in a fourth place effort in the Champagne (gr. I). His three-year-old season was interrupted due to a wrenched ankle, but he returned at age four to win the Gulfstream Sprint Championship, Donn Handicap (gr. II), and Tom Fool (gr. II). At stud, Deputy Minister became one of the great sires of recent times. From 1,141 foals, he sired 90 stakes winners, including 17 grade I winners, for $72 million in progeny earnings. Standing at Brookdale Farm in Kentucky, he was leading sire in 1997 and 1998, aided by big earners Touch Gold, Deputy Commander, and Awesome Again. His stud fee soared to $150,000 from 1999-2002. He also topped the broodmare sire list in 2007, led by Horse of the Year Curlin and champion filly Rags to Riches, who beat Curlin in that year's Belmont Stakes (gr. I). In the Breeders' Cup, Deputy Minister ranks #5 all time by earnings. His 26 starters in the Thoroughbred Championships have earned $5,370,560, including three winners—Open Mind, Go For Wand, and Awesome Again. Deputy Minister died in 2004 at age 25 (read more), but left several outstanding sire sons: Awesome Again has 10 grade I winners including Horse of the Year Ghostzapper; Silver Deputy sired earners of $67 million including champion filly Silverbulletday; Dehere gets top class runners in both hemispheres; and French Deputy has 10 grade I winners, including U.S. champion Left Bank and Japanese champion Kurofune. The table below lists Deputy Minister's 17 grade I winners. Also included are are the TrueNicks ratings for each cross.